(Childs Gallery, Boston); Dr. Ruth B. Benedict (1913-1993), Washington, DC; by descent to Philip and Judith Benedict; gift to NGA, 1997. A Discerning Eye: Prints and Drawings Given by Ruth B. Benedict, National Gallery of Art, Washington, 1994, no. 74. The Unfinished Print, National Gallery of Art, Washington, DC, 2001, proof 4, p. 77. A Discerning Eye: Prints and Drawings Given by Ruth B. Benedict. Exh. cat. National Gallery of Art, Washington, 1994: no. 74. Brodie, Judith. 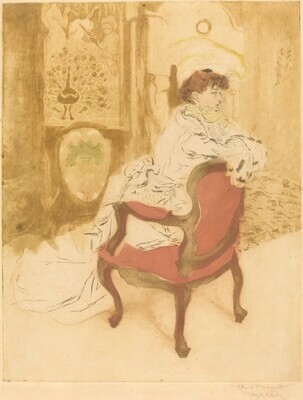 "The Metamorphosis of Jacques Villon's 'La Parisienne'." In Peter Parshall et. al. The Unfinished Print. Exh. cat. National Gallery of Art, Washington, 2001: 71-82.